Delight in a welcoming array of luxurious comforts from the Biltmore Hotel and Suites, Santa Clara, California in the heart of Silicon Valley. Featuring superior accommodations and executive-style amenities, this hotel is located just minutes from leading downtown San Jose businesses, in the heart of Silicon Valley, the Santa Clara Convention Center and California’s Great America. The perfect address for business and pleasure, enjoy it's signature style of unsurpassed luxury and value. Corporate Inn hotel is located just 10 minutes from downtown San Jose attractions and restaurants, San Jose International Airport and the Santa Clara Convention Center. Dozens of restaurants, shopping and entertainment are within walking distance of the all-suite hotel. Prime Silicon Valley location also puts guests in close proximity to business parks and corporate headquarters, and famous Northern California attractions including the Winchester Mystery House. Situated near Stanford University, Hewlett Packard and SAP, the Courtyard by Marriott is easily accessible to US 101, I-280, CA-85 and both the Mineta San Jose International Airport and the San Francisco International Airport. 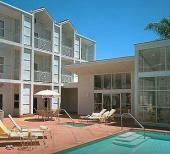 The Courtyard surrounds travelers with the conveniences that make business and pleasure travel easy. Relax and get ready for the day ahead in one of our spacious guest rooms, featuring a comfortable sitting area, complimentary wireless high-speed Internet access, and in-room coffee. Step outside your room and bask in the California sun. Take a swim in our year round heated pool or relax in our spa. The spacious open atrium surrounds you with the serenity of a sheltered garden that almost makes our guests forget that they are located in the Heart of the Silicon Valley. Our first class service and long list of amenities will ensure your comfort. Whether your requirements are for business or entertaining, the Cupertino Inn specializes in creating exceptional small meetings and memorable events. The Hilton Garden Inn Cupertino hotel is in the heart of the Silicon Valley area of California, and is 10 miles from San Jose International Airport, 45 miles south of San Francisco International Airport and accessible to major freeways and expressways. This hotel in Cupertino features deluxe accommodations and friendly California service, coupled with charming aesthetics in our newly renovated lobby, meeting space, restaurant, and public space. Its location is perfect for business and leisure activities within the San Jose, Sunnyvale, Santa Clara and Cupertino vicinity of California. The Hilton Garden Inn Mountain View hotel in Mountain View is situated in the center of the Silicon Valley area of California. Deluxe accommodations, friendly California service and a relaxed atmosphere await Hilton Garden Inn hotel guests. The Hilton Garden Inn hotel is within a 5 mile radius of the major Silicon Valley companies. One King or 2 Queen Beds, chair with ottoman, large work desk, 2 phones, each with 2 lines, data port and voicemail, refrigerator, microwave, coffeemaker, iron and board, also complimentary high-speed internet access are avaliable.